Online applications are invited from eligible candidates for participating in the selection process for State cadre posts. 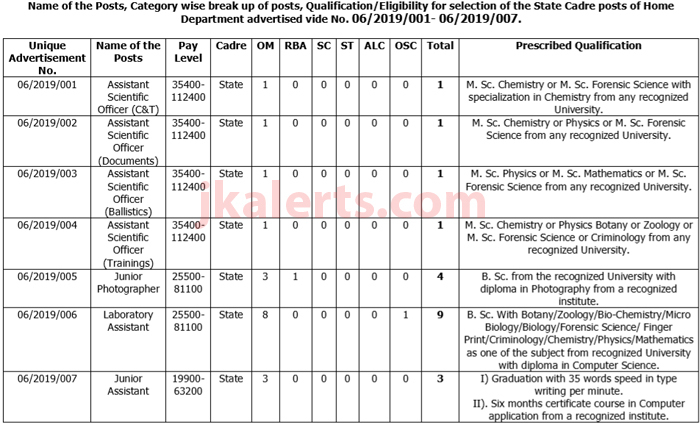 SSBJK Jobs Recruitment notification for State cadre posts. (b) 43 years in case of SC / ST/ RBA/ ALC/ OSC (Other Social Caste) candidates. (c) 42 years in case of Physically handicapped candidates. Rs. 350/-(Rupees Three hundred and Fifty Only)by Online payment gateway or Challan or CSC Connect. (It may be noted that there will be nominal additional transaction charges in case of online payment gateway and Challan options. In case of CSC Connect option, additional charges for filling form, print outs etc., will also be taken by concerned CSC Operator). Bharat Sanchar Nigam Ltd. (BSNL) JTO Recruitment 198 posts. ONGC Recruitment 2019 Total 737 Posts. Border Security Force (BSF) Constable (Tradesmen) Recruitment 1763 posts. Candidates are required to apply online through JKSSB’s online Application Portalwww.ssbjk.in. No other means/ mode of application will be accepted. a) Date of Commencement for submission of online applications = 05-02-2019.
b) Last Date for submission of online applications = 27-02-2019.